Climate change will heighten the risk of production shocks across the world’s biggest crop producers, a new study finds. The 1972-74 food price crisis is the stuff of policy legend. At a time when grain prices had been declining for decades, the global price of wheat tripled in the space of just three years. 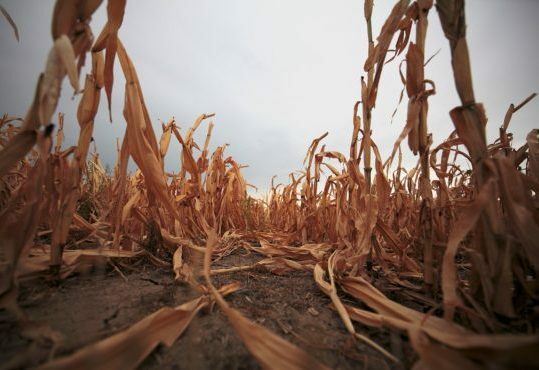 The trigger was a poor wheat harvest throughout the major breadbaskets of southeast Ukraine and southwest Russia, ravaged by an extremely hot summer with average temperatures 2-4°C warmer than usual. The effects of the resulting Russian Wheat Deal – in which the USSR purchased 10m tonnes of US wheat – rippled across the global food market and global grain prices soared. Since the early 1970s, global food markets have only become more integrated. Just three staple crops – corn, wheat and rice – account for more than half of global calorie intake. For each of these crops, just three countries produce at least 40 per cent of global production. With growing demands for food, animal feed and biofuels, this leaves the global food market exposed to further price shocks. In 2007-08, for example, the overstretched grain market needed only relatively small crop losses in Australia (caused by heatwaves), record-high oil prices and poor policy choices to cause the world food crisis of 2007-08. The result was a doubling of cereal prices and food riots in dozens of countries. In a new paper, published in Proceedings of the National Academy of Sciences, my colleagues and I show that climate change will heighten the risk of production shocks across the world’s biggest crop producers. Read full original article at Eco-Business.com.